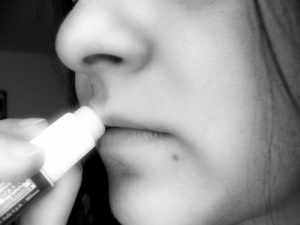 If you find yourself reaching for lip balm all the time, you may wonder whether you’re addicted to it. ChapStick and other lip balms don’t contain any addictive ingredients, but using them does alter the chemical environment of your lips by providing a protective and soothing barrier that helps prevent moisture loss and seals damaged skin from the elements. Good, right? Well, yes and no. If you have cracked, painful lips, ChapStick and other lip balms offer relief and protection while your lips heal. The bad news is, because your skin is protected, the regenerated cellular layer may not be as thick, plus your cells wont secrete as much natural emollient to protect your lips from drying out. This makes you dependent on the lip balm, because without it, your lips will dry out more easily. So, while lip balm isn’t addictive, it is habit-forming. Some of the ingredients in lip balm irritate your skin and make you more susceptible to chapped lips. If that’s the case, then why did manufacturers put them in there? Its probably less a ploy to get you to keep buying lip balm, and more a simple case of giving you what you want. Menthol produces a pleasant cooling sensation in lip balm, but it also acts as a mild irritant. Camphor and phenol help protect your lips from infectious agents and dry them out to speed healing, but this can lead to inflammation and discomfort. Alpha hydroxy acids act as a chemical peel, exfoliating your lips so they may appear smoother and younger. The acid thins and irritates your skin. Flavorings don’t necessarily irritate your lips, but they do make you more likely to lick them. Evaporating saliva dries out lips even more than the chemicals in lip balm. Switch from flavored lip balm to unflavored products. Consciously avoid licking your lips. Choose lip balm made using beeswax, oils, or petrolatum, preferably with sunscreen SPF 15 or higher, to prevent sun damage to your lips. Drink sufficient water. This helps to hydrate your lips from within. Try to limit exposure to dry air, cold, and windy conditions. Don’t use lip balm except when you need it. If you apply it all the time, your lips will adapt to it and you’ll need it all the time. ← What Does Percent Chance of Rain Mean?